Everyone promises upscale and wants to stay upscale but its hard to offer rooms at upscale prices when everyone in town is heavily discounting their rooms. They've been hiring dealers. 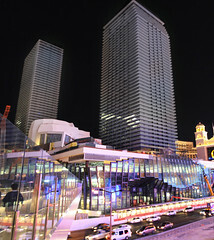 Alot of dealers who were out of work but had good experience levels have been hired by the Cosmopolitan. Wow Las Vegas... I still remember my first and last trip to Las Vegas and it was one of my best trips ever. Good thing to encounter still some updates about the place and it reminds me my one of a kind travel in that busy and bright place Vegas. It's gonna be completely new hotel in Vegas. Great! There is nothing wrong with a healthy competition. When Hotels compete, the consumer wins.